Whether you are a new business owner, an individual or an established business, credit card processing should be a priority. Even for existing businesses that accept credit card payments, the question about whether to switch your credit card processing company to get lower fees comes up. We will show you that with some research and effort, you too can enjoy the benefits of the best decision possible. As you probably know, you need to open a merchant account to accept credit cards. There are hundreds of merchant account providers and setting up an account is relatively easy. However, setting up an account that best fits your business needs can be very challenging. The problem isn’t a shortage of information, the problem is obtaining accurate and clear information you need to make the wisest choice. Unfortunately, the source of much of the chaos is the merchant service providers themselves. In most cases they are interested in charging you as much as possible as opposed to provided the best service at the lowest cost. They seem to believe that confusing their customers generates income. Perhaps it does, but from the customer side, when you don’t know what you’ve signed up for, it only causes worry and anger. In many instances the prospective merchant is unaware of the key factors to consider until after they have signed a contract. This lack of information costs business owners time, money and leads to tremendous headaches. We can’t stress this enough. It’s the single biggest mistake made by merchant account shoppers. Discounted rates are the #1 tactic used by merchant account providers to mislead you into overpaying for their services. The fees that result from these rates don’t take into consideration your monthly fees, per transaction fee, and address verification fee. The true overall cost can only be found by adding all fees into the equation. Another reason rates are deceiving is they only apply to one type of transaction and one type of card. Different transactions will cost you more, sometimes much more. It matters whether the card is swiped (card present) or keyed in (card not present). The type of card matters as well – AMEX, Visa, Mastercard, Discover. For these reasons, we consider quoted discounted rates to be more of a marketing gimmick than anything else – one quoted rate doesn’t give you accurate feel for your overall costs. Good merchant account providers will ask you questions about your business so they understand the type, size and number of transactions you will perform. Remember they will usually have experience dealing with your type of business so they can lend a hand to new business owners as well. With this information they can give you a fee schedule that works well with your business while focusing on lowering your overall costs. In addition, we hear from a lot of merchants that have concerns about signing a contract. Contracts aren’t necessarily good or bad depending on the terms. They should be evaluated on a case-by-case basis. The industry standard is a three year contract, but they vary from provider to provider. A contract could be a great thing, if you get a low-cost offering with limited cancellation fees from a reputable provider. On the other end of the spectrum, you could sign a contract with hefty cancellation fees from a poorly serviced provider. The key is to understand what you are signing. There are many processors that mislead their merchants by claiming they offer no cancellation fees. Instead, they charge you other unexpected fees that are not “termed” cancellation fees, but have the same effect on your wallet. Most new merchants assume that they will not run into processing problems and that good customer service is typical of all service providers. Ask an existing merchant that has already switched accounts multiple times and they might tell you that customer service is more important than overall cost or any other factor. Imagine your processor is down for some reason and you have to wait hours for customer support. Customers don’t wait for hours. They leave. Through our research we have found that there are enormous differences in the level of customer service between providers. This is why we usually favor larger providers because they usually have a larger customer service department which is readily available at all hours. The smaller operations have a smaller staff or even outsource their customer service, leading to poor service. The technology in this industry has come a long way over the years. However, you still want to make sure your processor has the capacity to handle your needs, whether it be internet, retail, wireless, mobile, mail or telephone processing. Be sure to consider your future needs as well. You may only utilize one mode of processing today, but you may need more in the future. In addition, you’ll want to work with a processor that can customize solutions for your business as opposed to a provider that limits you to their standard options. Their reputation in the industry should be very strong. Ask some businesses in your local area, look for testimonials on-line (be careful – don’t let just one good or bad review sway your opinion), and check to see if they have been recognized for awards within the industry. One of the best ways to determine credibility is to look at their customer satisfaction and customer retention rates. This is a very important relationship for your business; your provider will be processing the majority of your revenue so you want to make sure they are honest and forthright. 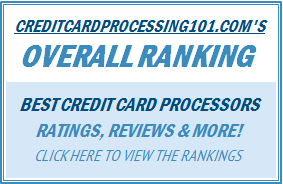 Credit Card Processing 101 has done independent and in-depth research on well over 100 merchant account providers. We looked at the companies from every possible angle to assemble a list of firms we feel are the best in the industry. We researched the provider’s portfolio of credit card processing products and merchant services. We looked for merchant payment solutions to the retail, services, restaurant, e-commerce and other industries. Additionally, we evaluated the modes of processing, such as internet, telephone, wireless, mobile, credit card machines and terminals. We even checked out the providers processing software. These are some important pieces of the puzzle, but they don’t tell the entire story. So we included much more info about each provider. This was a thorough and exhaustive process, but it was worth the time because we found a huge gap between the best and the average companies — and an even bigger gap between the average and worst companies. In addition to specific merchant account reviews we also share plenty of general information regarding merchant accounts and processing credit cards. Learn the most important criteria for picking a merchant account and why it’s not as hard as you think. Understand all the fees involved when you accept credit cards. Find out why choosing a merchant account based solely on the lowest discount rate could be a catastrophic mistake. Discover why the level of customer service you receive can make or break you. Determine whether your provider has the ability to service all the merchant solutions you will need, or may need in the future – online processing, retail, mobile, phone, wireless. Figure out if you need to use a credit card machine or can you virtual credit card processing? Uncover how your knowledge of transaction volume and ticket size within your business can help you negotiate and limit your processing fees. Learn the steps to set up a merchant account. Why should I start accepting credit card payments in the first place when my business is doing just fine without it? Establish the security measures that need to be taken to make payment processing safe. Do secure payments really exist? Has transaction processing through cell phones become popular? Should I accept mobile payments? What exactly is a payment gateway? Do I need one? Credit Card Processing 101 will reveal all this and so much more to help you avoid many of the common pitfalls experienced by merchants and assist you in making the best decision for your transaction processing needs.